One afternoon at the request of Srila Prabhupada's servant we went to collect eucalyptus twigs. From as early 1967 in San Francisco, he had used the twigs of eucalyptus trees as toothbrushes, a western substitute for the antiseptic neem twigs of India. I and a group of devotees from around the world went to the Chapultepec Park. 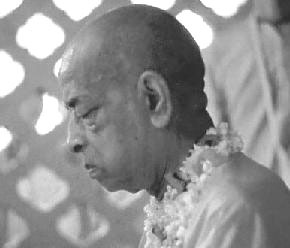 The first time that Srila Prabhupada went to walk in this park, His Divine Grace said, "This is not a park, this is a forest." "Without serving a pure devotee, one cannot advance in spiritual life." So we were careless as we went inside the park. Two of the police from the park started following us without been noticed by us, because we were all dressed in saffron robes and freshly shaved heads, which cannot help but attract the attention of everyone. We were looking around to find the best tree which would be fortunate enough to offer its branches for His Divine Grace's service and be promoted to a better position. We came to a secluded spot and found a nice tree which had been waiting for many lifetimes to be able to render some service to a pure devotee, by giving its branches. We were choosing the branches very carefully, because we knew that some of them would be in the lotus like mouth of His Divine Grace. We had just chosen a very nice branch when a loud voice broke our transcendental meditation in the service of our guru. "Hey what are you doing with that tree?" We turned around and saw two park police coming, but we could see that their mood was one of curiosity, rather than to punish us for cutting a tree in a national park. Being the only Mexican in the group I immediately came forward and said, "What is wrong, why are you shouting so loud, we are monks getting some branches." The park policeman came forward to me and asked who was in charge and I said, "I am." Then he said, "You have to come to our station here in the park because it is forbidden to cut flowers or anything in the park." I said, "Alright, but you have to let my friends go back to the temple. I will go with you wherever I have to go." So they agreed and the devotees went away nervously, not knowing what would happen to me. On the way to the station I was wondering what to say, because it would be difficult for them to understand that branches could be used as toothbrushes. When we got to the station, the policeman in charge was surprised to see me, with shaved head, saffron robes and with mixed feeling he asked, "What is wrong, what happened?" The two policemen informed their superior what we were doing, and he asked them why they had not brought the others. Then he curiously asked me for an explanation. At that time it came to my mind that eucalyptus can be used as a natural medicine, so I took a book out of my bag and showed it to the policeman saying, "This gentleman is my spiritual master and he is an elderly person and we were collecting these branches to make a type of Indian natural medical cure for him. He comes from India and we could not find his medicine in the regular drug store, therefore we came to get these branches." He seemed satisfied with my answer, and said, "The purpose may be good, but you cannot cut those branches without permission from us." Then I explained the purpose of the Hare Krishna Movement, and who Srila Prabhupada was and I gave them some books. The policeman then said that he would let me go this time but not to do that again. I asked him if he would let me take the branches and he said "Yes, but cover them because I don't want everyone to see this." I quickly left the place, feeling happy because I was successful in my mission, getting eucalyptus twigs for Srila Prabhupada. When I got to the temple I brought the branches to Srila Prabhupada's servant's room, which was near to Srila Prabhupada's room. I opened the door and I was very surprised to see Srila Prabhupada was there; he had to walk by to the bathroom. He asked, "What do you have there?" Because I had a big bunch of eucalyptus branches covered with a cloth, he could not see anything. I answered, "Eucalyptus for you Srila Prabhupada." He moved his head in his classic mood. "Good" he said and told me, "Give it to Sruta Kirti." I did so, offered my obeisances and left. I was very happy thinking that Sri Krishna was so merciful. I had to go through some anxiety to get these branches, but at the end I had the chance to have the darsana of Sri Krishna's pure devotee. The devotees were downstairs waiting for me and they wanted to know the whole history. I told them all and then at the end everyone said, "Srila Prabhupada Ki Jaya!"